NMA daily charts of Nifty turns to sell signal after 3 months(Approx)… with current trailing stop loss comes near 5536. A long call butterfly spread consists of three legs with a total of four options: long one call with a lower strike, short two calls with a middle strike and long one call of a higher strike. All the calls have the same expiration, and the middle strike is halfway between the lower and the higher strikes. 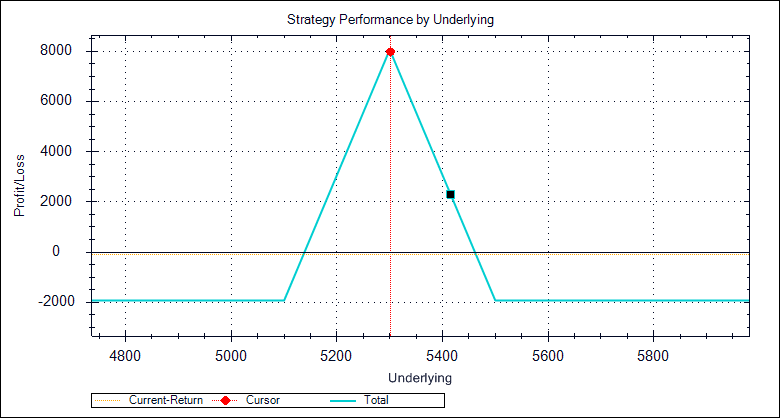 When a butterfly spread is implemented properly, the potential gain is higher than the potential loss, but both the potential gain and loss will be limited. Maximum loss of Rs 2000 below the break even point 5138 abd above 5463. Profits if nifty expire between 5138 and 5463 and maximum profit of Rs 8000 if nifty expire at 5303. FII Buy or Sell doesnt matter… Its all about how the demand got created/weaken decides the direction of the trend. at any instance of time. Maximum profit occurs not at 5303.It is at 5300 that maximum profit occurs. A pay off table can be prepared to find out the points of maximum profits and break even points. Here strategist seems not to have executed the strategy before. This strategy has some serious defects. 1.One will have to hold the positions till expiry most of the time. This involves a risk of Rs2000. 2. The chances of Nifty expiring exactly at 5300 is very low. 3.If the pay off from this strategy is worked out everyday after closing one will see that it rarely produces any profit. Profit comes on the last day that too only if Nifty closed between the break even points. Delta of 5500 put is 1.Its time value decreases as this put goes into ‘deep in the money’ Delta of 5300 puts goes up fast because they will move to ‘at the money’ and ‘in the money’. There two numbers of 5300 puts sold. Delta of 5100 put will not change much and its premium will be static. Here also net profit will not be much. As a result getting out at an intermediate stage is not possible. For example his profit at yesterday’s closing is nil. A good option strategy does not leave things to chance. He may lose 2000 each for 20 months before he gets his 8000 in one month.I have tried this strategy many times and lost money always. May be I was unlucky. But I do not like a strategy that depends on luck. It is not rational. I prefer to take a lottery for 2000 instead of losing my 2000 for gaining 8000. I traded this, now the position is in loss.